Welcome to Apartments Castello Belvedere Desenzano del Garda. The tower lying high above the hill, the ancient portal and the eighteenth-century building of Belvedere Castle dominate Lake Garda and form part of the serene beauty of a 50,000 sq m Natural Park. Against a backdrop of olive trees, serving as a frame for the blue of the lake, a charming historic Residence with a unique fascination. An ideal place to spend an exclusive vacation near the lake and in beautiful countryside. The orginal structure of the Villa, belonged to the noble Rosmini family, has been preserved, with its internal courtyard, and converted into different types of apartments, that are prestigious both for their architectural aspect and for the spectacular view on the lake they enjoy. A beautiful and magical spot, where dreams become true among a variety of romantic landscapes close to Desenzano del Garda, the heart of the lake and a tourist resort par excellence. In the foreground, a view of Belvedere Castle showing the orginal building and the new prestigious wing. Among historic details of an important past, numerous living solutions in this paradise for all tastes and sizes required. Three studio apartments of approximately 28 sq.m., seventeen 50-sq. m. two-rooms apartments and seven 70-sq.m. three-rooms apartments, all stylishly furnished. Common reception rooms are also available for the guests at Belvedere Castle, that is open throughout the year, such as the entrance hall, secretary's office and lounge, in addition to the park and internal patio, olive groves, swimming pool and terrace overlooking the lake. The splendid beams across the ceilings, the interiors harmoniously fitted out and painted with strokes of the spatula, together with Tuscan ceramic flooring, are some of the secrets of a structure of a singular nature. The Castle does not betray its origins and offers you a variety of ambiences, which are all different but have in common close attention to detail and design in keeping with the original style. The 27 apartments enjoy a view of the lake as you have never seen it before and give you access to large terraces and private porticoes. From attics to 70-sq.m. three-rooms apartments, your stay at Belvedere Castle will always be more than just a vacation. The centuries-old olive groves in the park that only guests can access and the hills forming the background to Belvedere Castle outline a gentle landscape sloping down to the Garda Lake. To cool down on hot summer days, the Castle places at the disposal of its guests a large swimming pool that is easily reached from the spacious solarium. Of an unusual shape, and with and adjacent children's pool, thanks to its position on the top of a hill and the perspective that comes into play, the pool seems to merge with the lake. 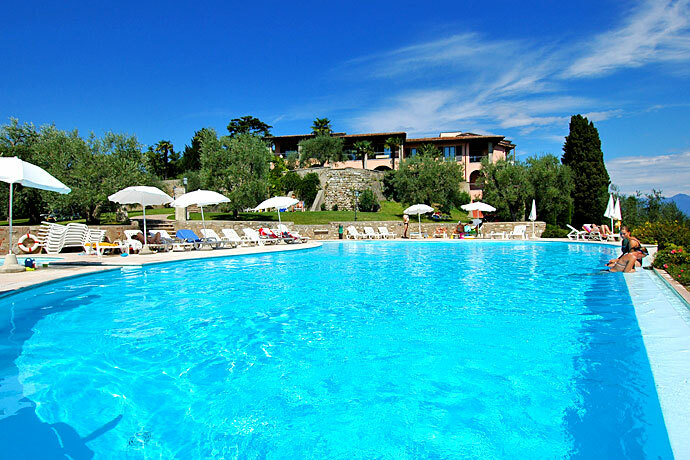 Open-air sports range from activities in direct contact with nature such as swimming in the pool, jogging, walks in the park and mountain-bike riding, to the numerous leisure activities available at Desenzano del Garda and its environs. You can play golf or tennis, go riding, wing shooting or go-carting, play all water sports. (Apartments Castello Belvedere Desenzano del Garda apartments residence).